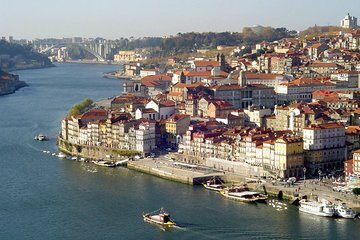 Immerse yourself in one of Europe’s most magical cities during this 4-hour walking tour of Porto. Your friendly, professional guide will meet you in the city’s center and take you through its rich history and culture, starting with the magnificent cathedral. Wander through the Treasure Museum before heading through the Jewish Quarter to Riberia Square. You’ll get to see the stock exchange palace up close and personal before feasting on a delicious Portuguese lunch. Sip on traditional Port wine during a wine tasting and marvel at the striking Santa Clara Church, among other stops. Your tour ends back at the historic city center. Une balade décalée des vieux quartiers de Porto au travers de ses secrets d'histoire sérieusement revisités par notre sympathique guide. Si l'histoire contée s'éloigne de la réalité, elle a eu le mérite d'éveiller notre curiosité et nous pousser à rechercher l'histoire véritable de Porto. Ana Paula knows her her city and country! Her historical knowledge is extensive and detailed. She answered our questions comfortably and easily. We mostly wandered through and around the Jewish Quarter and Riberia Square and ended with a lovely River Cruise. The Private Porto Secrets tour was very enlightening! I compared what I learned with some colleagues who took a larger group tour and many things I learned were not even included in their tour! And I had pictures to prove it! I would HIGHLY recommend this tour! Ana, the tour guide, spends the extra time and effort with you! Our guide was incredibly knowledgeable. We learned so much about this history of Porto but also Portugal. This really is a trip to discover things off the beaten path. While our guide pointed out certain sights and explained about them, she left a visit to those places on us while showing us hidden gems of the city. We saw things I know we would have never found on our own. This tour was worth while and a highlight of our time in Porto. Bruno was amazing!!! he took us to various places and gave us a history lesson regarding each place. It was a lot of walking but it was well worth it. Thank you Bruno! Pasamos un día genial con Ana, explicaciones muy completas y amenas. Recomiendo entrar al palacio de la bolsa y hacer el tour por el Duero. The walking private tour was exactly what we needed! You can see monuments and museums from the deck of the bus, but you cannot see intricate details of small secretive places. Our guide Anna was knowledgable and passionate about the city she lives in. At our own pace we walked along the river, went into old quarters and breathed the unique atmosphere of the place. It was a great tour that exceeded our expectation. This was a disappointing tour due to the fact that we expected a private tour, and we were joined by another person who was not quite so fit to keep up with our party of six. We thought we were supposed to be having a break for lunch, which never happened until the end of our walk and we only had a short stop for coffee in a not very salubrious café. We would definitely not recommend this tour to others.